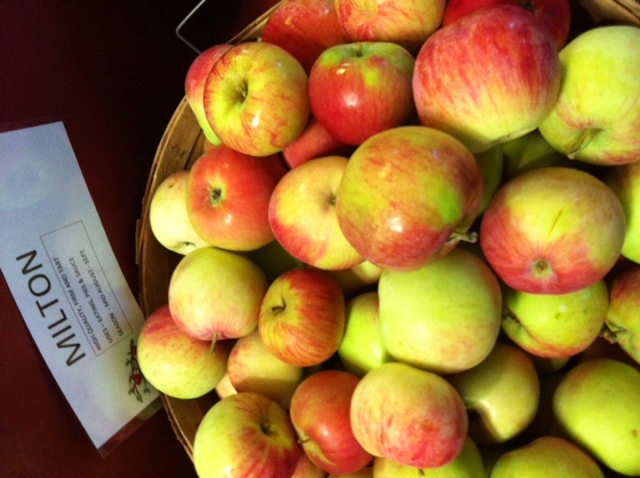 Braeburn – Originally from New Zealand, introduced in 1950’s. Spicy and tart with a juicy, crisp texture. Holds well in cooking as well as being a great eating apple. 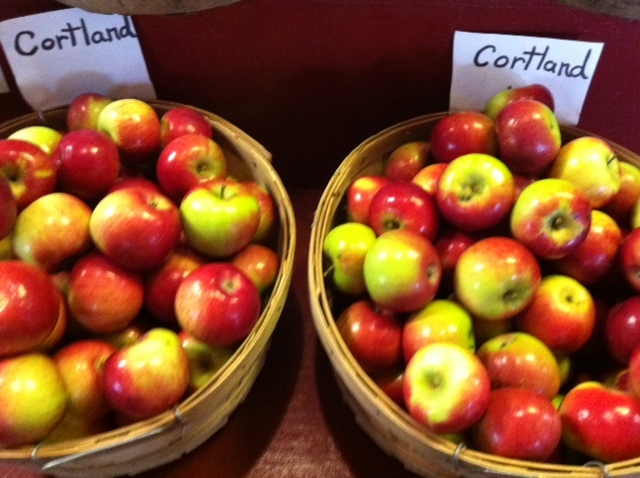 Cortland – large sized apples with mostly red skin and red strips appearing on the lighter areas. They have a mild, tender flavor. Ideal for snacks, salads, and fruit platters because the flesh will remain white even after being cut. They are also good for baking with. Empire – Native to New York, it is grown almost entirely on the East Coast. 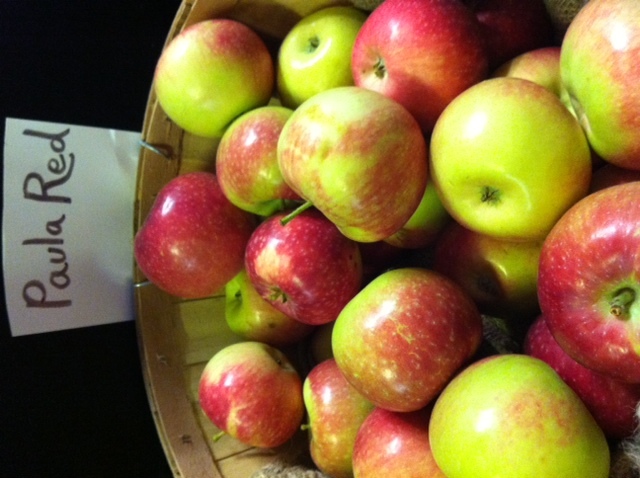 It is a cross between McIntosh and Red Delicious. Medium sized. Distinctive strips. They are great eaten raw, especially right from the orchard. They are good for baking and for making applesauce. The flavor is sweet and the creamy flesh is semi-firm. Fuji – originally from Japan, it was introduced to the US in the 1980’s and it is now the fourth most widely grown in the US. Large sized. Sweet and crisp. Varies from golden to blushed pink. Holds its shape and texture well when cooked and also stores well. Gala – originally from New Zealand, it was introduced to the US in 11965 but didn’t become popular until the 1980’s. It is now the third most widely grown in the US. Golden with pinky stripes. It is aromatic and tart. It holds its shape when cooked and great in applesauce. 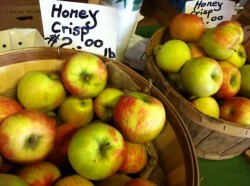 As one of the first harvested apples, it doesn’t keep very well, so don’t buy after early spring. Golden Delicious – Medium to large sized. Golden yellow in appearance with a elongated shape and a five point bump at its base. The sweet flesh is yellowish-white and crisp. It is good for both eating and cooking. Honey Crisp – Native to the US. Red skin with a golden background. Crisp and sweet. Good for eating fresh but also holds well during cooking. Ida Red – Native to the US. Good for eating fresh. Great for pies and their texture holds well in baked apple desserts. Sweet and tart flavor. 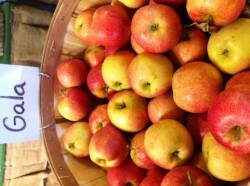 Jerseymac – a month-early variety of McIntosh. Medium to large size. Uniform shape. The skin is red with green slashes. Good for eating, but not great for baking. Jonagold – native to New York. It is tangy. It is a bit soft to eat out of the hand, but it is creamy when cooked. Macoun – from New York. Bright red with purple blush. Firm and juicy with a sweet white flesh. Great for eating fresh in salads or with cheese. McIntosh – From North America. Medium to large sized. White flesh is sometimes lined with red veins. Skin is greenish with bright red blush. Slightly tart flavor. They bruise easily as they are tender, but can be stored for 2-3 months in cold storage. They are good to eat or baked in pies and sauces. Milton – From the US. Medium sized. Yellow/green with red blush. Firm and Tart. Good for cooking apple sauce and baking pies. Mutsu – also called Crispin. From Japan. Large and green, it looks almost like a Golden Delicious. Sweet and sharp. Good for eating fresh, holds its shape well for cooking, especially baked apples. Paula Red – From the US. Bright red. Early season variety. Small to medium sized. Mild taste. Good for eating fresh. Flesh becomes soft when cooked so it’s better for applesauce. Pink Lady – A trademark name, the variety is actually Cripps Pink. One of the first apples marketed as its brand name rather then variety. From Australia. As the name suggests, the skin is delicate pink. Sweet, honeyed and tart. Best for eating fresh. 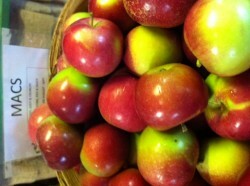 Red Delicious – Used to make up almost half of the American apple harvest, but now is only a little more than a quarter. Medium to large sized. Bright red, sometimes with stripes, and have distinctive bottom bumps. Crsip and sweet. Best eaten raw straight from your hand, and is not recommended for cooking. Apples should be kept uncovered or in a perforated plastic bag in the refrigerator. Warm temperatures will cause them to lose their crispness and flavor, so if they are kept out of the refrigerator, make sure it is in a cool, ventilated place avoiding direct sunlight. To prevent apples from turning brown when cut and exposed to air, sprinkle with lemon juice or soak them in a bowl of ½ cup water and 2 tbsp lemon juice. Cook the lentils in boiling water until tender, about 15 minutes; drain, set aside. Steam the squash in a steamer basket until just tender, about 4 minutes. Transfer to a plate. In a medium saucepan, bring the stock to a boil; keep it at a bare simmer over very low heat. In a large saucepan, melt 1 tablespoon of the butter in the olive oil over moderate heat. Add the bacon, garlic and shallot and cook until softened, about 3 minutes. Add the rice and stir to coat thoroughly. Add the wine and simmer until almost evaporated, about 4 minutes. Stir in one-third of the simmering stock and cook, stirring constantly, until the stock is almost entirely absorbed; repeat with the remaining stock. The risotto should be creamy with just-tender rice grains after 20 minutes. Add the lentils, squash, Swiss chard and apple to the risotto. Stir in the Parmesan, sage and the remaining 2 tablespoons of butter. Season with salt and pepper and serve immediately. Preheat the oven to 350F. Cut the squash in half, remove the seeds and fibers. Place in a buttered, oven-proof dish top with the remaining 3 ingredients. Cook for 40 minutes, turning over halfway through. Season. Preheat oven to 375F. Combine butter, syrup, lemon juice, cinnamon, and apple in a bowl. Place mixture into the hollow of each squash half. Set in a baking dish and roast for about 45 minutes or until squash is soft (test with a fork). Sprinkle with chopped walnuts, if desired. Spread the almonds in a small frying pan over low heat and stir until the pan is hot and the almonds feel warm. Sprinkle with the tamari or soy sauce and stir to coat and slightly toast, about 1 minute. Cool. Add the green beans to boiling water with 1 tsp salt and cook until tender-crisp, 4-6 minutes. Drain. Meanwhile, stir together the tamari/soy sauce, rice wine, sugar, and sesame oil in a small bowl, set aside. In a large pan over medium-high heat, Add teh canola oil and garlic and stir fry 30 seconds, Add the green means and toss, about 3 minutes. Add the tamari/soy mixture and stir to coat. Place in a serving bowl and garnish with the almonds, serve immediately. *Mario Batali’s recipe, it is a traditional dish from Parma, Italy where I was studying last year. It’s incredibly easy and delicious. A great way to use those greens you might not know what to do with! To make the dough: combine the flours and salt in a bowl, make a well in the center and add the lard and olive oil. Blend with fingers or a pastry cutter until it resembles course crumbs. Sprinkle with the water and toss with a fork until the dough begins to form clumbs. Add more water if too dry. Gather the dough into a ball, wrap in plastic wrap and chill in the fridge for at least 30 minutes. To make the filling: combine 1/4 cup pancetta with a little garlic, 1/4 cup onion, and generous amount of pepper. Set aside. Cook the remaining pancetta in olive oil in a large skillet over med-low heat, about 5 minutes. Add the remaining onino and cook covered for 15 minutes, until the onion has softened. Uncover, raise to high heat, and cook until rich golden brown, about 6 minutes. Add the greens, reduce heat to medium, and cook until tender, about 7 minutes. Stir in remaining garlic. If there is a brown glaze at the bottom, add a little water and simmer, scraping up the brown bits. Move to a bowl and let cool. Add 1 1/2 cups of the parmigiano and reserved pancetta mixture. Season to taste and add extra cheese if desired. Blend in eggs. Preheat the oven to 400F. Brush a 12-14 in pizza pan/baking dish with olive oil and divide the dough in half. Roll out on a floured surface and place on the pan. Spread the filling over the dough, leaving 2-inch border. Cover with the other rolled out half of dough. Pinch the edges of the dough together. Make a couple slashes on the top for steam to escape. Bake for 20 minutes, then brush the crust with some olive oil, and bake for another 20 minutes until the top is pale gold, crisp, and the edges golden brown. Cut into wedges. Preheat the oven to 375F. Place teh apples in a large bowl with the vanilla seeds, brown sugar, cornstarch, zest and juice of lemon and cinnamon then toss to coat. Transfer to 10-inch cast iron skillet and set aside. In a seperate bowl, stir together the flour, sugar, oats, baking soda, salt and zest. Add butter and rub into mixture with your fingers until the butter is no larger than a small pea. Sprinkle over the apple mixture. Bake for 1 hour until the apple filling is bubbling and the topping is golden brown. Serve warm with cream or your favorite Applecrest Creamery’s ice cream!